This photo was identified as “horse dare riders” (note the stripe on the pants) and after some research and talking to several past state troopers I am told that Troop D under the direction of Captain McGrath, started the first State Police riding team known as the Rough Riders. After the success of the Troop D team, Captain Fox of Troop C started his own riding team know as Troop C’s Spotted Horses. B Troop followed with a team made up of Black Horses. 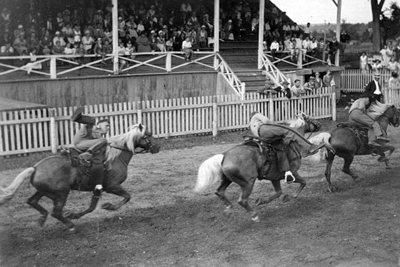 Troops A, K and G also had riding teams and they performed at local fairs. The use of the horse teams not only served as training for the members but also served as a valuable tool to expose the public to the Troopers. The Oswego County Fair at Sandy Creek runs from August 9 through August 13. The History Center will again have a display at the Heritage Building as well as other historical societies and historians. Please stop by. The theme this year celebrates local farmers.